It seems that some point HBO was mooting April 24th as the premiere date, as that’s what this PDF presently says. 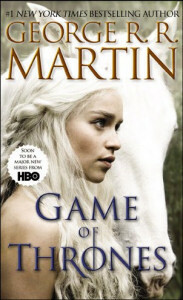 Paperbacks of the further novels in the series are being released with a banner on top citing the HBO series. The document indicates Random House (parent of Bantam Spectra) intends a full-court PR press, including television spots. HBO has advised Random House of a “multi-million dollar” marketing campaign in the run up to the April 17th premiere of the series. The re-release is due for March 22nd. Tip of the hat to Olaf for the pointer!